• The Trumps and the Nazis, Part I: Don Jr.
• Why Has Congress Ceded All Its Power to Trump? Actually, Director of National Intelligence Dan Coats didn't say the Russians are coming. He said yesterday that they are already here, working hard to disrupt the midterms any way they can. They are not closet Republicans. Their goal is to sow discord and weaken America—for example, by undermining faith in elections. DHS Secretary Kirstjen Nielsen said that the entire system of U.S. democracy is in the Russian crosshairs. Their comments came after weeks of both parties criticizing Donald Trump for his refusal to stand up to Russian President Vladimir Putin and to attack him point blank for interfering in the 2016 election. Trump's absence from the briefing room where Coats and Nielsen spoke further emphasizes that Trump does not think Russian attacks on America are a problem (more below). The Trumps and the Nazis, Part I: Don Jr. When one is teaching a history class, or writing political analysis, or participating in a discussion, or the like, one must be very careful about invoking the Nazis and/or Adolf Hitler. That move is, in most cases, the ultimate intellectual cheap shot. As the Nazis are the embodiment of pure evil in Western culture, drawing a comparison to them is all-but-guaranteed to bring the useful portion of the discussion to an end. This is known as Reductio ad Hitlerum, a term coined in 1951, by which point the phenomenon was already noticeable. In the context of Internet discussions, the same concept is known as Godwin's Law. I've been out hearing the left talking about all these things, fascism, Nazism on the right. And when you look at the actual history of how these things evolved, and when you actually look at that platform versus the platform of the modern left, you say wait a minute, those two are really heavily aligned and, frankly, contrary to the right...You see the Nazi platform in the early 1930s and what was actually put out there...and you look at it compared to like the DNC platform of today, and you're saying, man, those things are awfully similar, to a point where it's actually scary. The interview took place, incidentally, at the premiere of Dinesh D'Souza's new film Death of a Nation: Can We Save America a Second Time?, which also draws a Democrat-Nazi parallel, while at the same time presenting Donald Trump as a modern Abraham Lincoln. So, delusional thinking was clearly in the air. It is...unlikely, shall we say, that young Trump has made a careful study of pre-World War II Europe and the circumstances that gave rise to Nazism and other forms of fascism. Nonetheless, let us consider his thesis. When people allude to the "platform" of the Nazi party, what they mean is the one the Party produced in 1933. That one was the culmination of several years' platforms (dating back to 1920), and was effectively the "last" platform, as Hitler would seize power as dictator soon thereafter, bringing an end to democratic elections. Xenophobia: It hardly even needs to be said that the Nazis disliked anyone who was not ethnically German. Jews, of course, but also blacks, and immigrants of all stripes, and Roma, and non-Germanic whites. The platform specifically proposes that only "only Nationals can be Citizens of the State" and "only persons of German blood can be Nationals" (#4). Foreigners are allowed to remain as guests (#5), and may not vote or claim any sort of civil rights (#6). If there are not enough jobs for everyone, foreigners are to be deported (#7). And no new foreigners are to be allowed into the country, under any circumstances (#8). Populism: The Nazis wanted to tear down big businesses so as to create jobs and opportunities for blue-collar workers (#12, #13, #14, and #16). It should be noted that they wanted to do it directly, by nationalizing most industries, and not indirectly through things like, say, tariffs. Anti-Internationalism: The Nazis disdained participation in the "materialistic World Order" (#19) and preferred to adhere only to German law, and to pursue German ends. They also favored withdrawal from international treaties (#2). Anti-Press: The Nazis weren't anti-press, per se, they were just opposed to any media whom they viewed as perpetrating "deliberate political lies." Such newspapers were to be banned (#23). Religious "Freedom": The Nazis wanted everyone to be able to practice their religion as they saw fit. As long as that religion was, of course, some form of Christianity. "The Party as such stands for positive Christianity, without associating itself with any particular denomination," (#24). Pro-military: The platform also calls for vigorous promotion of and spending on the German military (#22). Now, let us imagine that we wanted to make Trump Jr.'s argument for him: That there are strong parallels between the Nazi program and the current program of the Democrats. The only way to get there is to conflate National socialism (which is actual socialism) with Democratic socialism (which isn't). The Nazis, as noted above, favored nationalizing many industries and businesses. That included department stores (#16), corporations (#13), and other large enterprises (#14). This is socialism, as it was understood in Hitler's time, and as it is still understood in some of Europe today. In present-day America, by contrast, Democrats/Democratic socialists favor government involvement in some aspects of the economy, like setting a higher minimum wage, and possibly setting a national minimum income. Many even favor single-payer healthcare which, while it could theoretically be socialist (the government owns and runs everything, as in Britain), is not generally conceived as such in the United States. In nearly all American single-payer proposals, most hospitals and medical practices would remain privately-held (besides the VA), and the government would merely set standards and pay the bills (which is how Medicare and Medicaid already work). And there is certainly no left-wing American politician, not even Sen. Bernie Sanders (I-VT) or Alexandria Ocasio-Cortez, who has come within a country mile of calling for the nationalization of corporations and stores. And so, the socialism of the Nazis and that of the present-day Democratic Party are really apples and oranges. Perhaps this description seems vaguely familiar. In Helsinki, I had a great meeting with Putin. We discussed everything...We got along really well. By the way, that's a good thing, not a bad thing. Now we're being hindered by the Russian hoax -- it's a hoax, OK? Needless to say, the crowd ate it up. And clearly, with the base, the Trumpian version of events has taken hold. Every poll shows that roughly 30% of Americans think that election meddling, the Mueller investigation, and everything else Russia-related is a scam and a lie. And the success the President is having only emboldens him to tell more (and probably bigger) lies. It took him over a year to reach 2,500 lies on the Washington Post's lie tracker. Now that his daily lie rate has more than doubled, he's going to pile up the second 2,500 in about six months. To reporters (@Acosta) complaining re your treatment at Trump rallies: Now u know what it’s like for conservatives invited 2speak at college campuses. (if the invite isn’t rescinded). I wish you were treated differently. But maybe u should cover college protests differently now. Implicit in Fleischer's argument is the Trumpian idea that the press is made up entirely of partisans, and so reporters and actual political partisans are entirely equivalent to one another. One last commonality that we will note, beyond the Big Lies and the press hatred, is conspiratorial thinking. Mein Kampf is, in essence, one big conspiracy theory. Most famously, it falsely blames Jewish bankers for stabbing Germany in the back at the end of the World War I, and attributes the nation's woes in the 1920s to them. However, it actually gets much wilder in the later chapters, as the cast of villains is expanded to include not only Jews, but also communists, and various liberal groups, and the press (naturally), and black Jazz musicians, and modernist artists and architects, and a host of others. The Führer didn't just dislike these "degenerates," however, he was persuaded that they were all actively working together against the German people. It's not the Star Trek protagonist or the James Bond character, unfortunately. In fact, it's a reference to a conspiracy theory that's all the rage in some right-wing circles these days. Q is an anonymous fellow (or maybe several fellows) who releases little bits of information on the web community reddit every once in a while that are designed to shed light on the so-called "storm" that is gathering in response to Trump's heroic efforts to fight the globalists, the media elite, the deep state, etc. The storyline, and its cast of evil-doers, are pretty far out there, and evolve on a daily basis. But included on the list of bad guys (and gals) are the Jews (of course), the Illuminati, Hollywood filmmakers (many of them alleged to be pedophiles), the Rothschilds, banks in general, Sen. John McCain (R-AZ), Barack Obama (naturally), Hillary Clinton and Huma Abedin (also naturally), and George Soros (another obvious inclusion). In short, it's basically a mash-up of Pizzagate, Mein Kampf, and The Da Vinci Code. Donald Trump has not openly endorsed the theory, but Sean Hannity has, which probably means Trump is not far behind. 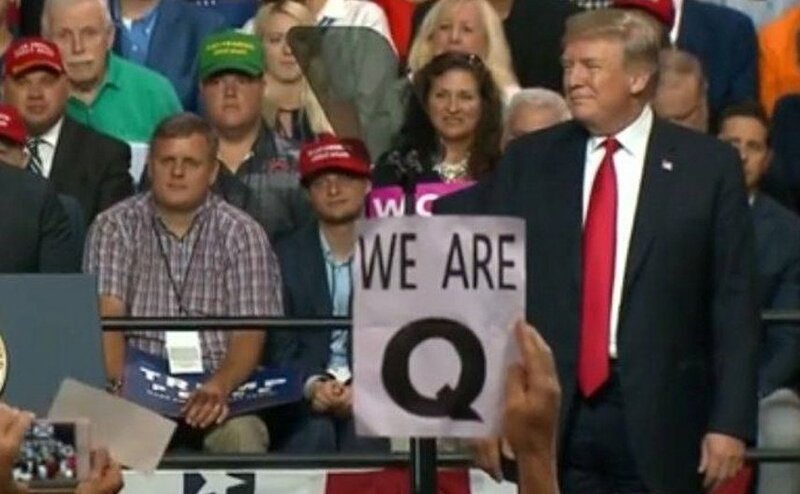 There would be much irony, of course, if "Q" is actually the Russians, since that would mean that many Trump followers would be thinking that the truth about the Russians is a hoax, while the hoax from the Russians is the truth. Eschewing the usual Tuesday scheduling, Tennesseeans headed to the polls on Thursday for their primaries. Overall, the results were pretty anticlimactic, as nearly all of the big races were settled by huge margins. To the extent there was drama on the statewide ballot, it was in the Republican gubernatorial primary, where four candidates jockeyed for position as the #1 Trump fan. The winner was Bill Lee, an outsider entrepreneur (he owns a plumbing business), who dispatched outsider entrepreneur Randy Boyd (he sells dog fences), and establishment candidate Rep. Diane Black by 12 and 13 points, respectively. That was actually a barnburner compared to the Democratic side of the contest, where moderate former Nashville mayor Karl Dean handily defeated the much more progressive State Rep. Craig Fitzhugh. Fitzhugh ran an impressive, and high-energy, campaign that got some lefties' hopes up, but it wasn't enough, as he lost by 45 points. When it comes to the Senate, things are expected to get interesting in the general election, when Tennesseans pick a replacement for Bob Corker (R). On Thursday, however, they were as dull as dishwater, as former governor Phil Bredesen trounced his nearest competitor by a staggering 86 points, while Rep. Marsha Blackburn (R) trounced hers by 69. Bredesen is leading in the polls, but has to be at least a little bit worried that less than 380,000 Democrats showed up to vote for him last night, compared to more than 715,000 for Blackburn. Many of the House races, by contrast, actually were competitive on Thursday. But, in the inverse of the situation with the Senate seat, the drama is now over. Hillary Clinton won the two districts represented by Democrats right now by 57 and 18 points, and Trump won the seven districts represented by Republicans right now by 57, 49, 41, 36, 36, and 35 points. The upshot is that the retiring Rep. John Duncan (R) will be replaced by Tim Burchett (R), the tried-for-governor-and-failed Black will be replaced by John Rose (R), the running-for-Senate Blackburn will be replaced by Mark Green (R), and the Tennesse House delegation will otherwise remain exactly the same. OK, we're jumping the gun a bit, but it's important. The last real test of Democratic energy is on Tuesday in Ohio. Former representative Pat Tiberi got fed up with being in Congress and decided he didn't even want to finish out his term, so he quit cold turkey. The special election to replace him in OH-12 is on Tuesday. The winner will get to serve for 3 months at best, but probably less, since Congress might adjourn in October so that members can get out on the trail. Nevertheless, the Democrat, Danny O'Connor, and the Republican, Troy Balderson, are locked in a pitched battle in the district, which is north and east of Columbus. It has been in Republican hands since 1920, except for an 8-year-stretch during the Depression and 4 years in the 1980s. It is an R+7 district Donald Trump won by 11 points. And by all measures, both parties think it is tied right now. When Rep. Conor Lamb (D-PA) won a deep red district in Pennsylvania earlier this year, Republicans took a deep breath. If O'Connor wins this one, in a district and state Trump won easily, there will be outright panic in the GOP, so Republicans are throwing everything they have got into pulling this one out of the fire. Many Republicans see the OH-12 as a true bellwether of what will happen in suburban/exurban districts around the country in November, especially in swing states. If suburban women decide they have had it with Trump and show it by switching sides and voting for a Democrat for a change, it could be a harbinger of bad news for the red team in 3 months. O'Connor is keenly aware of how Lamb won in a similar district and is following his playbook closely, even to his rejection of Nancy Pelosi as speaker if the Democrats capture the House. Why Has Congress Ceded All Its Power to Trump? Historically, Congress has not sheepishly ceded all its power to the president, even when the same party controls everything. Former Sen. Robert Byrd (D) fought with Bill Clinton all the time, for example. According to Doug Sosnik, who was a senior adviser to Clinton, the real reason that Congress now operates like a wholly-owned subsidiary of the executive branch is that there are no more Byrds around. There used to be senators and representatives whose primary loyalty was to the institution of Congress, rather than to their party. They are no more. Much of the problem can be attributed to the enormous turnover in Congress in recent years. In the next Congress, there will be at most 45 senators who were in office in 2010. In the House, only a third of the members were there before the 2010 midterms. With Speaker Paul Ryan (R-WI) retiring, if the Republicans hold the House, the GOP will have its third speaker in 6 years. There are no more Sam Rayburns, who serve 17 years. In addition, 10 of the 21 House committee chairmen will not be back next year. When no one is in the place more than a few years, it is not surprising that there is little loyalty to the institution itself. It would have been inconceivable even 4 years ago, but the RNC is now instructing GOP donors not to give to the Koch brothers' network. Maybe this is a reaction to the retreat the Kochs held in Colorado last weekend, in which Charles Koch criticized the Trump administration and said he and his team would not fund the Republicans in key Senate races, including North Dakota and Nevada. Maybe it is because the Koch network is now so powerful that it rivals the Republican party itself. Whatever it may be, RNC Chair Ronna Romney McDaniel wrote a memo yesterday saying: "Some groups who claim to support conservatives forgo their commitment when they decide their business interests are more important than those of the country or Party." Guess who she meant? What she wants is blind loyalty to anyone with an (R) after his or her name. Another factor that is causing the Democrats grief is the rise of the affluent urban professional as a key part of the Democratic Party. These people have different priorities than the average voter, according to the Voter Study Group's survey of 8,000 Americans in 2016 and also in 2011-2012. The Democratic elite has as its top priorities gay rights (61%, vs. 34% for the average voter), gender equality (69% vs. 35%), and racial equality (66% to 39%). In other words, the Party's social goals put it at odds with many voters, who have different priorities.